Today i would like to bring to your attention to a new Ep i found in our promos inbox. 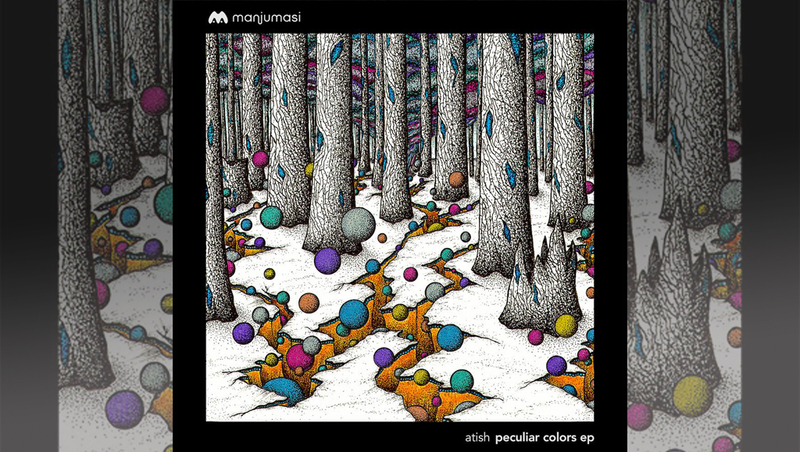 “Peculiar Colors” by Atish will be released on “Manjumasi” on the 23rd of March 2017. MAMA005 which is the catalog number indicates that this is the 5th release on the San Francisco based label “Manjumasi”. This is a big moment for Atish as this happens to be his debut release. I have been following his dj sets for a few years now and i have always loved his track selections and his flow while performing. I remember being in New York and hanging with a friend of mine “Satya”who is a top notch producer and someone who i respect a lot musically.Satya mentioned to me that i should go to Brooklyn to attend the a City Fox party. She really wanted me to hear Atish and i was wondering what the fuss was about. I remember very clearly going to this sick party in a warehouse in Brooklyn and hearing Atish. He def knew what he was doing and i was very impressed by his performance. Not to mention the insane production and overall vibe of “City Fox Party”.I went and said hello to him after to congratulate him on his set. We stayed in touch after but i never thought that he would start his own label (Manjumasi) and start producing music.I was very happy indeed to when Manjumasi started as i knew that the content would be top quality. Given the amount of exposure and the different countries and festivals Atish has been playing in, it was pretty evident that this label would be showcasing the best influences he picked up along his tours. However, now for me to see an Atish EP is really the cherry on the cake. Not only i am happy to see him debut but the result is top notch. 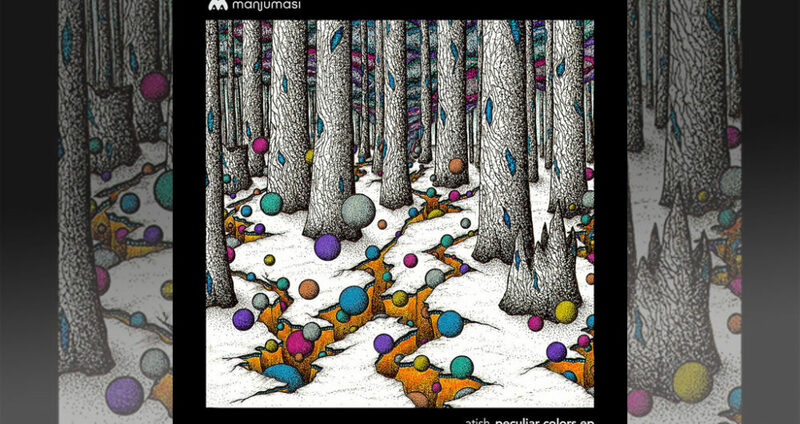 The original of “Peculiar Colors” is something i could listen to and play as well. Its got a infectious Dance Floor Groove and the track make me want to get up and start dancing. In addition, the Latin Jazz riffs are superb. Now Thats real High level Taste for me! Its always difficult to mix latin and jazz riffs and yet keep the vibe underground at the same time. Usually when producers play with such elements within a house music soundscape, the track tends to become too happy or it looses its cutting edge raw feel. Atish has really managed balance the vibe and keep it cutting edge but musical at the same time. I am listening to the track as i write this review and there is not one second where i am bored. Very Impressive!!!! I appreciate the rest of the ep too, but the remix that also caught my personal attention was the Peculiar Colors remix by Dance Spirit. This remix really twisted the feel of the track and made it in to a flamencoish gypsy dance floor bomb!! I will def be playing this out. Dance Spirt has def been releasing some top music on many labels across the globe and i am beginning to really follow this producer closely. What i love about about the releases from “Dance Spirit” is the ability to keep the tracks floor friendly in terms of the groove but also to incorporate the musical elements in a classy way and create something for the head space of the listener too. I can really get lost in these tunes and usually i tend to stay away from melodic elements as most producers enter that cheesy melodic zone due to lack of taste which is a real turn of for me. However, Dance Spirit seems to get it right every single time! My top track of the ep still remains the original of “Peculiar Colors”. A great debut from Atish and an exciting future for his productions. Lots to look forward to from this talented Producer and superb label!!! News : Zone+ &Usif release new Ep “Laya” on Wind Horse Records.